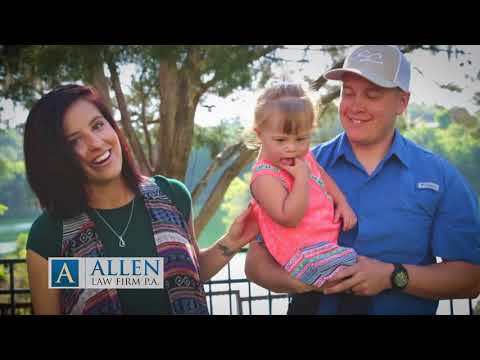 Gainesville & Ocala FL Accident Attorneys | Allen Law Firm P.A. Personal Injury Attorneys - Allen Law Firm, P.A. At Allen Law Firm, P.A., we take your injury personally. Let us help you fight for compensation. You focus on taking care of yourself and your family while we handle the rest. We Aren’t Just Trial Attorneys. We are about SERVICE, and RESULTS. We take personal injury cases personally. No case is ever too big or complex for us to handle. Our personal injury lawyers use nearly 200 years of collective experience to represent Florida's injured. At the Allen Law Firm, P.A., we give our best to ensure your best. To us, clients are more than just schedules, case files, or accident claim numbers. Our clients are real people who are facing real legal problems and are seeking real solutions. We grow to know our clients and their stories, their concerns, and their anxieties, but more importantly, we grow to serve them fervently and loyally. Simply put, our Gainesville law firm and our Ocala law firm, which includes a mock courtroom, are places where you will feel ‘taken care of’, mainly because we think it’s important to treat every client like we would our own family. This means we expend our utmost in time, energy, resources, and services to ensure total satisfaction from beginning to end – and beyond. When you come to us in your time of crisis (emotional, physical, or legal), you can trust that we will assume the full responsibility of meeting your needs and protecting your interests. There really isn’t another Gainesville or Ocala accident law firm that does client care in the way we do. Let this Gainesville & Ocala personal injury law firm shoulder the burden of the legal process so you can focus on what really matters: recovering and healing. We understand that accidents can happen at any time or place. We operate on a 24-hour workday schedule and can take your call any day or night. If you are looking for an Attorney in Ocala or an Attorney in Gainesville, Call the Allen Law Firm, P.A. today to request a free consultation. We proudly serve clients throughout Florida from our offices in Gainesville and Ocala. Since our firm’s founding, we have always operated on a simple, yet guiding tenet: our clients are like family. We strive to be the most dependable, reliable, and ethical personal injury law firm in Florida. In order to do so, we employ extremely competent and experienced individuals to ensure that our clients receive fair compensation for their losses. Our every endeavor is to help clients obtain the tools and resources needed to restore complete health and comfort. Our Ocala personal injury lawyers are guided by a deep sense of commitment that cannot be learned or purchased. We were gifted with a natural sense of service and genuine compassion that guarantees unbridled diligence, sincere empathy, and unwavering faithfulness. In this context, we work day-in and day-out to earn the highest possible regard and lasting approval of the men, women, children, and families we assist and befriend. This is our mission and vision, and continues to inspire the work we do every day. We at the Allen Law Firm, P.A. have always taken our role as legal counselors and servants to the public seriously. Serving in the local community has always been a foundational value of our firm: we are thankful of our role in the community as legal counselors and use our position to focus on the needs of others. The Allen Law Firm, P.A. always gives back an annual portion of our profits to a variety of local charities for the good of Alachua County. The legal team at Allen Law Firm, P.A. understands that encountering the loss of safety on a scooter or moped can end very painfully. We do not want scooter accident victims to be ignored or denied in their case like they can be on the road. Attorney Allen’s affinity for motorcycle riding and our substantial history with motorcycle cases keep the Allen Law Firm, P.A. committed to taking motorcycle accidents personally. Trust the #1 Motorcycle Attorney in Gainesville and Ocala. We know what is best for you as a rider and what is best for your personal injury case. The State of Florida implements “strict liability” with respect to dog bites. This means that owners are held liable if their dog bites someone, even if they had no prior knowledge that the dog might bite. Trucking Accident cases can cause significant injuries. Whether you call them trucks, semi-trucks, tractor-trailers, or big rigs, large trucks can be dangerous on our roadways. Even though they are operating mammoth vehicles down roads filled with smaller autos, truck drivers do not always heed the potential perils of their position. Wrongful death cases can be long, complicated, and emotionally draining, but we are always dedicated to supporting our clients throughout this trying time. Choose carefully when you are looking for representation that will carry you though this experience successfully with care and understanding. Even with the most complicated boating accident claims, Allen Law Firm, P.A. has the experience and the resources, including engineering and accident reconstruction experts, needed to prove your case. We understand how traumatizing an accident can be, and that is why we work to get your life back to normal as soon as possible. We work hard to make sure you do not suffer needlessly. Allen Law Firm, P.A. always helps find liability in a bicycle accident and does whatever is necessary to administer justice to the neglectful party. Vehicle injuries can be extensive and long lasting if you find yourself with a firm that is not tending to your specific needs. Client care is our specialty. If you were involved in an auto accident in Gainesville, or if a loved one has been harmed in a car crash in Ocala caused by another negligent or reckless driver, do not think that you have to face the upcoming legal process on your own. I would recommend Bill Allen Law Firm to everyone. They work hard for you and make you feel at home. I was in a car accident and didn’t have any worries. My car insurance was taking they time and they got the ball rolling. Great customer service and great team of lawyer’s!